Everyone knows that trailers represent the most direct promotional tool that a studio has at their disposal for marketing films; they allow audiences to catch a glimpse of what a movie is all about in a short time frame. But what happens when the blood, sweat, and tears that goes into making a movie proves nearly as interesting as the story it tells? You end up with something like the above clip for The Boxtrolls, which in under two minutes says a whole lot more about the production than a mere teaser ever could. Let's stop for a moment to catch up. If all of the design work on display here looks especially familiar, then that means you've probably seen 2009's Coraline or last year's ParaNorman. 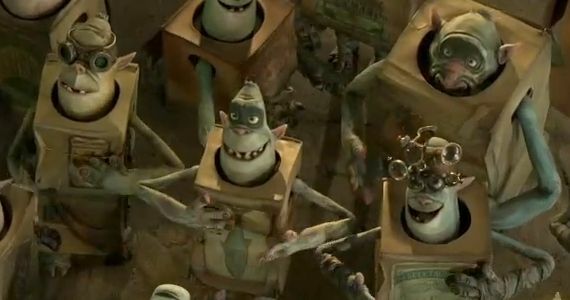 The Boxtrolls hails from Laika, the same stop-motion animation studio that produced both of those films; this time around, Laika has Graham Annable and Anthony Stacchi on board to serve as the directing team. The film's set-up is simple: Eggs (Game of Thrones' Isaac Hempstead-Wright) is an orphan who lives with the subterranean trash collectors of the title. When the trolls become targeted by a nefarious exterminator (Ben Kingsley), Eggs springs into action to save his foster family. What's less straightforward is all of the effort required to bring the project to life - something that becomes quite clear just a few short seconds into this new trailer's run time. To describe what's seen as "painstaking" doesn't quite cut it. Of course, the difficulties of bringing stop-motion animated endeavors to life have been well-documented, so none of this may come as that much of a surprise; however, Laika's eagerness to show off their work ethic and artistic process might. This is meticulous stuff, the kind of behind-the-scenes sneak peek that can give viewers an expanded appreciation for what the animators have to do in order to pull off their particular brand of screen magic. If nothing else, no one will be able to call the people who toiled over each figure, every motor and all of the backdrops "slouches," once The Boxtrolls hits theaters. And for an ending treat, we get to watch all of these elements in action: Laika caps off this piece with brand new footage from the finished product . Unsurprisingly, at least based on the teaser, it all looks pretty phenomenal - there's a great deal of life in every character and an abundance of stunning detail in every aspect of the sets. Since The Boxtrolls doesn't come out until fall 2014, it may be awhile before we see a full trailer that introduces the cast and establishes the plot more - but for now, this is more than enough reason to start looking forward to next September.